Vancouver, BC - Skyharbour Resources Ltd. (TSX-V: SYH) (OTC Grey: SYHBF) (“Skyharbour”) is pleased to provide an update on the exploration activities at the Western Athabasca Syndicates’ 246,643 hectare (609,469 acre) Preston Lake Uranium Property. The Western Athabasca Syndicate consists of Skyharbour, Athabasca Nuclear Corp. (TSX-V: ASC), Noka Resources Inc. (TSX-V: NX) and Lucky Strike Resources Ltd. (TSX-V: LKY) (“the Syndicate”). Final datasets from the helicopter-borne VTEM plus survey (time domain EM and aeromagnetic gradiometer) and the fixed-wing radiometric survey have been received and are currently being analyzed by Phil Robertshaw, P.Geo., to provide a final detailed interpretation. A total of 4,840 line kilometres of high resolution VTEM plus (flown by Aeroquest Airborne) with an additional 4,400 line kilometres of radiometrics (flown by Goldak Airborne Surveys) was completed on the Preston Lake Property providing approximately 1,046 square kilometres of coverage. The VTEM coverage consisted of seven blocks extending eastwards from the Alberta border for almost 100 kilometres with line spacings of 200 to 300 metres. The airborne radiometric survey consisted of one large block extending up to 60 kilometres east-west and up to 36 kilometres north-south. This low-level survey utilized 50 L crystal detector volume and line spacing of 200 metres. The VTEM survey has succeeded in mapping a large number of interpreted graphitic-type basement conductors which are compliant with basement geology trends as revealed by the associated detailed aeromagnetics. These strong, multi-kilometre conductive anomalies represent primary exploration targets moving forward. Basement geological trends in the furthest western block are oriented NW-SE, while those of the eastern blocks are E-NE which is similar to Fission and Alpha’s Patterson Lake South (“PLS”) high-grade uranium discovery area. Provisionally, over 300 kilometres of graphitic-type conductor segments, some approaching 10 kilometres in length, occur in the combined eastern blocks of the Preston Lake VTEM coverage. Cross-cutting structural features and flexures affecting the conductor traces, which are often associated with the high-grade uranium deposits of the Athabasca Basin including the PLS discovery, are of particular interest as prospective follow-up targets. The airborne radiometric spectrometer coverage has mapped a significant number of enhanced radioactive locations classified into contributions from uranium, thorium and potassium sources. Initial interpretation of the radiometric data has identified areas with elevated uranium counts that can be correlated along and between multiple lines which may indicate the presence of radioactive boulder trains or in situ uranium mineralization. These radiometric features, particularly where possible source areas coincide with prospective EM conductors, are high-priority targets for follow-up ground work as this is the signature that led to the PLS discovery. Management cautions that past results or discoveries on proximate land are not necessarily indicative of the results that may be achieved on the Western Athabasca Syndicate Project. As previously announced (see News Release dated August 8, 2013) geological field crews are on the ground at the Preston Lake Project. The current phase of work is focused on evaluation of targets identified by the Syndicate’s Technical Committee. An advanced targeting matrix is being utilized which includes preliminary data from the VTEM plus and radiometric airborne surveys, results from initial ground reconnaissance work, compiled geological maps, and compiled data from historic assessment reports and government surveys. The Syndicate Technical Committee and combined geological team met in Cranbrook two weeks ago and identified fourteen high-priority areas for targeted fieldwork using the detailed targeting matrix. These targets were prioritized based on a detailed criteria set consisting of similar geological features and exploratory indicators present at Fission and Alpha’s nearby PLS discovery. The current, ongoing phase of exploration will include boulder prospecting using scintillometers, radon and silt sampling using both helicopter and boat support, geochemical and radon soil sampling, geological mapping and prospecting, and biogeochemical sampling. The Syndicate will employ a systematic, proven and cost-efficient exploration methodology that has led to numerous uranium discoveries in the region and throughout the Athabasca Basin, including using Pylon AB5 Series Portable Radiation Monitors which provide accurate real time analysis of radon levels in both water and soil. Fieldwork is being carried out by Terralogic Exploration Services under the direction of Jarrod Brown, M.Sc., P.Geo. The target areas will be reevaluated based on the detailed geophysical data interpretation and results from the current field program to determine areas for further evaluation in the next phase of work expected to commence in mid-September. By the end of this summer’s field program in October, a total of approximately $1.5 million will have been spent in exploration on the project between airborne geophysical surveys and follow-up ground work. On August 28, 2013, the members of the Syndicate received final TSX-V approval of the formal agreement (see news release dated July 10, 2013) to form the Western Athabasca Syndicate. The Company also announces that pursuant to its stock option plan, Skyharbour has granted incentive stock options to its various directors, officers, employees and consultants to purchase up to an aggregate of 300,000 common shares in the capital stock of the Company, exercisable for a period of five years, at a price of $0.10 per share. The Company’s 10% rolling stock option plan was approved by shareholders at the Annual General Meeting of the Company held on August 22, 2013. These options are subject to a four-month hold period. 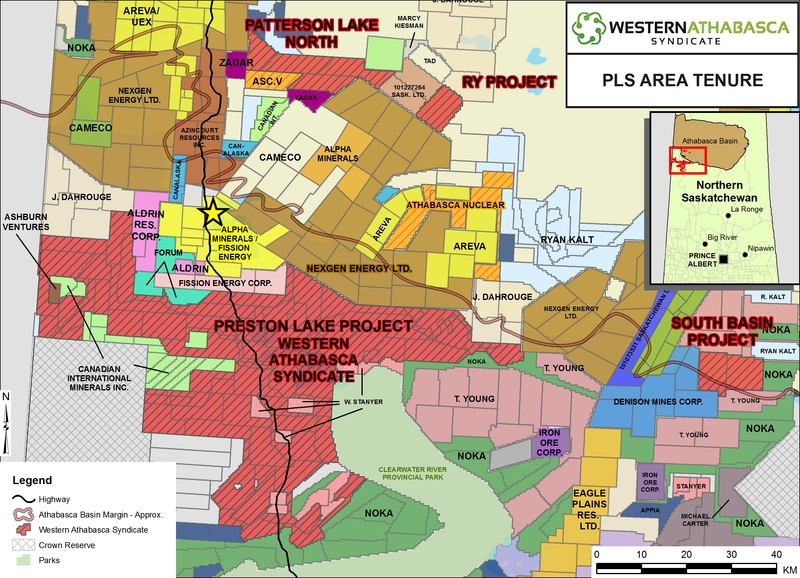 The Western Athabasca Syndicate is a strategic partnership formed between Skyharbour, Athabasca Nuclear, Lucky Strike and Noka to explore and develop a 287,130 hectare (709,513 acre) uranium project base (the “Western Athabasca Syndicate Project”) that is the largest mineral claim position along the highly prospective margin of the Western Athabasca Basin controlled by a single group. Under the terms of the agreement, each of the four companies has an option to earn 25% of the five uranium properties comprising the Western Athabasca Syndicate Project by making a series of cash payments, share payments and incurring their pro-rata amount of the total $6,000,000 in exploration expenditures over the two-year earn-in term of the agreement. The properties were acquired for their proximity to the PLS discovery and interpreted favourable geology for the occurrence of PLS style uranium mineralization. 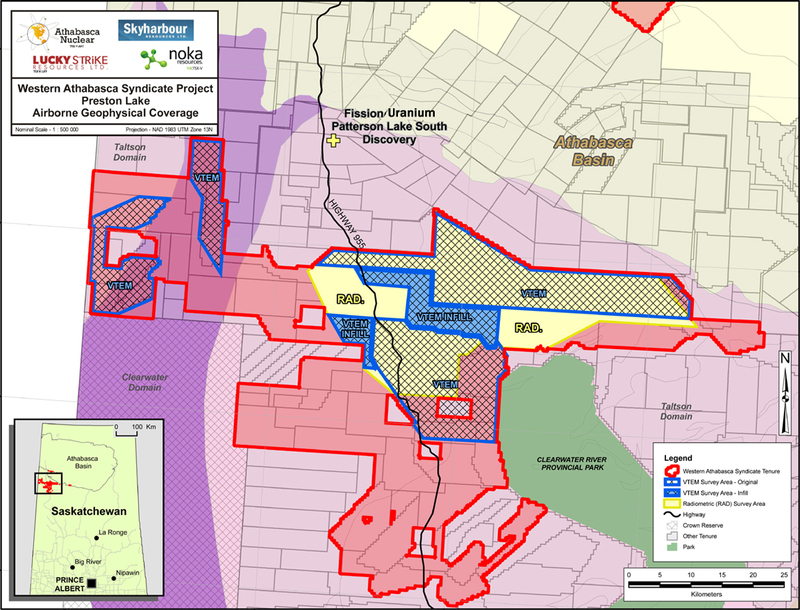 The bulk of the Syndicate land package is bisected by all-weather Highway 955 which runs north through the PLS discovery on to the former Cluff Lake uranium mine. The Athabasca Basin of northern Saskatchewan hosts the world’s largest and richest high-grade uranium deposits accounting for just under 20% of global primary uranium supply. Athabasca uranium deposits have grades substantially higher than the world average grade of about 0.1% U3O8. The Patterson Lake area has received escalating exploration attention and claim acquisition activity as a result of the new, shallow discoveries made by Alpha and Fission which includes the recently reported drill interval of 9.08% U3O8 over 54.5 metres in drill hole PLS13-075. Consistent high-grade, near surface U3O8 assays from Alpha and Fission demonstrate the potential for high-grade uranium mineralization on the geologically prospective yet underexplored margins of the western side of the Athabasca Basin. Skyharbour Resources Ltd. is a uranium exploration company and a member of the Western Athabasca Syndicate which controls a large, geologically prospective land package consisting of five properties (287,130 hectares or 709,513 acres) in the Athabasca Basin of Saskatchewan. The Company’s goal is to increase shareholder value through new discoveries and developing exploration projects in geopolitically favourable jurisdictions.